Pretzel buns have become quite popular and this gluten-free version is the perfect bed for your burger. 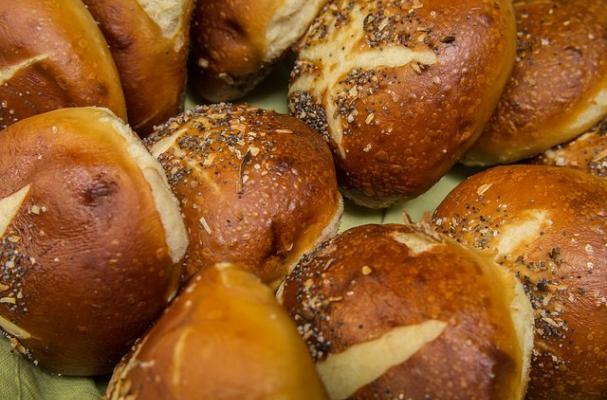 Crunchy exterior, soft interior with a salty bite, homemade pretzel buns are simply out of this world. In the microwave, heat the milk and butter to 110 degrees F. Set aside. Combine the flour mix, and brown sugar in the bowl of a stand mixer or in a mixing bowl. Add the yeast and blend. Add the milk and butter mixture and the eggs and yolk to the flour blend. Beat on medium speed for 3 minutes. Line 2 baking sheets with parchment. Coat each with PAM vegetable spray. (This prevents the baked rolls from sticking to the paper.) Turn the dough out onto the parchment and knead until smooth. Divide into 12 equal pieces. Using your hands, roll each piece into a ball. Cover with oiled plastic wrap and let them rest in a warm place for 30 to 40 minutes. Preheat the oven to 425 degrees F. In a large pot, bring 8 cups water to a boil, and then add the baking soda. In batches, place the dough in the water and cook for 30 seconds on each side. Using a slotted spatula, remove the rolls and place onto the prepared baking sheets. Sprinkle with pretzel salt as they come out of the water, to ensure the salt sticks. Use a sharp knife to cut an “X” shape in the top of each roll. Bake 12 to 15 minutes, turning pans halfway through baking. Serve warm. Reheat in a 350 degree oven for 5 to 7 minutes.